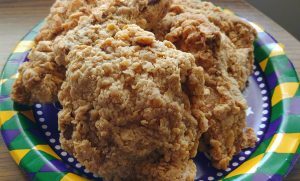 Leftover Fried Chicken–yes I can almost hear you say, “Is there such a thing?” It was for hubby and me the day after Mardi Gras. Believe it or not it, Mardi Gras day is the only day of the year when we splurge on fried chicken. It’s a family tradition. It wouldn’t be Mardi Gras without a box of spicy fried chicken. I knew when I bought the box this year there would be leftovers. It was one of those “food deals” that often add to the food waste problem in America. You know the ones–the special offers that give you more than you need for a cheaper price. The famous two-for-one deals, buy-one-get-two-free, or in this case, get eight pieces of chicken for the price of five. I do love a deal, so I planned accordingly for leftovers. A little “hangover cure meal”…just in case! Our family loves all spicy ethnic foods. Most of all, we love okra. 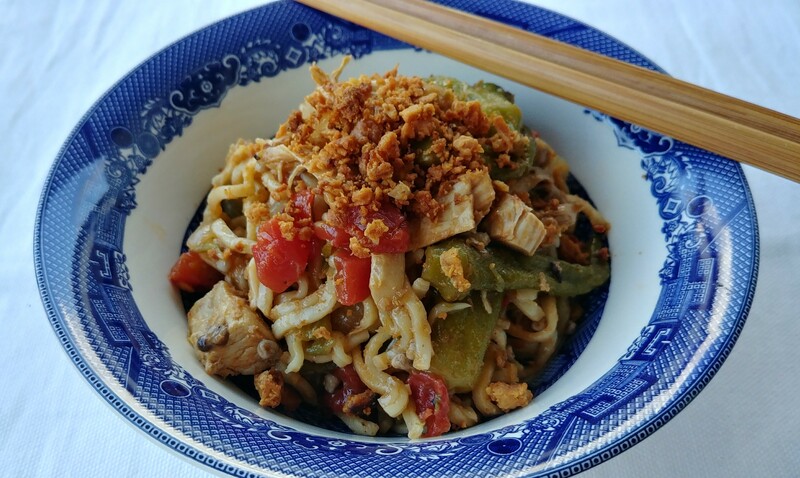 This ramen noodle dish is a blend of those loves-okra, tomatoes, onions, green chilies, and spicy red chili paste. If you don’t like your food spicy, the paste can be omitted. Packs of inexpensive ramen noodles can be used, just don’t use the seasoning packet. Save the packets and use to lightly season canned beans before draining and rinsing. This recipe uses all parts of the leftover fried chicken. It is the same process as using the last piece of fried chicken to make a whole pot of Fried Chicken Chowder. The bones make the rich stock to cook the noodles and the skin is rendered to make a crispy topping for the finished ramen. Remove skin from chicken. Set aside. Separate meat and bones. Return meat to refrigerator. For the stock: Add chicken bones, onions, garlic, and bay leaf to small stockpot. Cover with water. Bring to a boil. Skim off any foam on top. Reduce heat to low and simmer 1 hour to 1 1/2 hours. Add more water if needed during process to yield 1 1/2 cups of stock. Strain. Add chicken skin to a food processor. Mince. Heat a cast iron skillet over medium high heat. Add the minced chicken crumbs. 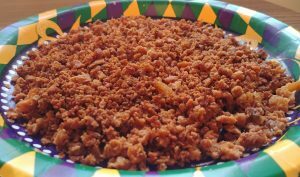 Render the fat until the crumbs are brown and crisp, like bacon bits. To the cast iron skillet, over medium high heat, add 2 TBSP olive oil and 2 tsp chili paste. Stir fry the okra for five minutes. Remove from heat. Add 1 TBSP olive oil to saucepan over medium heat. Add sliced onion and minced garlic. Saute for 5 minutes or until softened. Add diced green chilies and tomatoes. Continue to cook, stirring occasionaly for 10 minutes. Add the chicken, okra, and stock. Bring to a boil. Add the ramen noodles. Reduce heat to low. Cover. Simmer 5 minutes. Top the finished ramen with the crispy chicken bits. 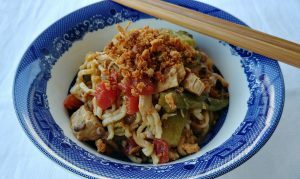 Put Your TO COOK IS TO CREATE Thinking Cap on: Think about your favorite ethnic noodles dishes and stir fries. Imagine all the different combinations. What kinds of vegetables do you enjoy? Substitute your favorite fresh vegetables for the okra. Add scallions or green onions. What other proteins could you add? Shrimp? Mushrooms? Like an egg on your ramen? Add it. Like a pad thai? Add crushed peanuts to the crispy chicken bits for the topping. Have leftover crispy chicken bits? Use like you would bacon bits-salads, soups, baked potatoes, loaded fries, or add to sautéed green beans. FOOD FUN: I created this dish by merging a classic Southern dish of okra and tomatoes with an Oriental dish of ramen. I guess you can say I crossed many cultural boundaries. Sometimes that’s a lot of fun! Do you have two favorite dishes from two different food cultures? Think about how you could combine the two into one new dish. It can be as simple as combining ingredients and spices.